I look forward to the Dobell Prize. It's the antidote to the celebrity silliness of the Archibald and can be guaranteed to leave you feeling far more elevated. It's pointless to rehash old Florentine/Venetian arguments about the relative merits of 'disegno' and 'colore' but I can't help but feel that there's no accidental link between a prize for drawing and the range of ideas and experiments it attracts and a the innate qualities of the artistic method itself. This year is happily mixed. The Dobell has embraced landscape which can lead to anything from the intricately drafted fantasias of Robyn Mayo to Anne Edmonds abstracted 'Light Waves Over the Pilbara'. This year I find it hard to get excited by the winner, Pam Hallandall's circular 'Tsunami', it's almost too easy to read, too one-dimensional. Far better are works by the predictably brilliant Godwin Bradbeer and Rina Franz, whose drawing and poem on wood 'A Time To Reflect' is gentle and touching. One of my favourite works is Stephen Hall's 'Mumbai or Merry-Andrew always plays a straight bat and sheds a solitary tear in passing', despite my aversion to the 'title as essay' school. Hall might be dramatizing some personal mythology but as opaque as the meaning is the work is still striking. There's a man's jowelly disembodied head, looking like a renaissance pope's funeral mask. A horse seems to form itself out of charcoal, the hindquarters the preliminary sketches of life, the head stripped of skin and back to flesh. It's an image that reminds on of Dürer's horsemen of the apocalyptic, but here the splashes of red feel like carrion, this might be a much more immediate appocalypse, a Mumbai of terror and blood. Dagmar Cyrulla is an artist I find endlessly interesting. Here her piece 'Keeper of Secrets' is like a slash of dream narrative in red and black. 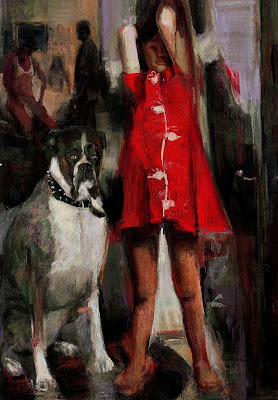 A girl, restless and angular, looks out at us with an implacable looking dog beside her, in the background through a door, two adults are by a bed, the woman in just her bra. The hints of narrative are loaded with ambiguity, the home is the site of both security and outrage and this unsettles. Cyrulla's smeary gouache highlights and obscures just those details we would require for confirmation of meaning, the girls half obscured face, the expression of the adults, the darkness on the flesh at the top of her thighs. Cyrulla easily reminds one of Eric Fischl, but I think that the comparison does her an injustice. Her ambiguous domestic narratives don't have the American's carefully judged voyeuristic shock value, instead they might be before or after and act and tell us that we can never know what to think about the lives of others. Despite too much post-structuralism at a young age I surprised myself in finding I could still look at a work entitled 'Looking for Baudrillard' and enjoy it. 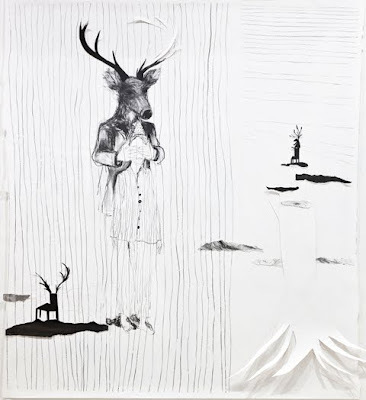 Tanya Chaitow's large drawing and collage again seems to touch the sub-conscious, here a boy in pyjamas, perhaps sleepwalking, has his eyes covered by a man standing behind him, who has the head of a deer. the lines that run up and down two thirds of the picture both extend out the stripe of the boys pyjamas and give the whole image an upward trajectory, making boy and man (deer?) appear to float free. On the right are drawn and cut images of a tree. Obviously Chaitow is presenting symbols that are deeply culturally rooted but now, having lost their immediate meaning, serve to unsettle. It shows, and perhaps Baudrillard would agree, that signs with no implicit meaning still have power. You get a fair bit of portraiture with the Dobell and on the whole it's not bad. I couldn't help noticing that some of the gigantism of the Archibald is creeping in, the pointlessly over-sized close-ups that seem to hollow out the sitter. Peter Marshall's 'Freya and a north-east view of the town of Sydney in 1812' maintains enough strangeness to lift it above being merely a very accomplished portrait, the sitter's expression and dislocation of place give it a layer of intrigue. 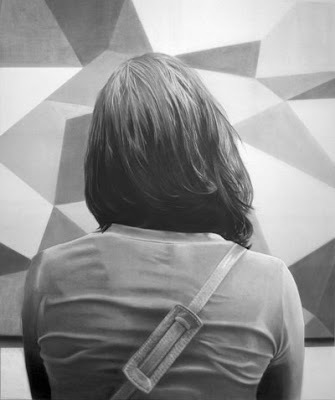 Just on the right side of too big is Mark Hislop's 'Revelator' a portrait from the rear of a woman looking at a drawing. It's a bravado piece of photo-realism but it also makes us wonder about portraiture and the experience of looking in galleries. I like the work a lot, tender anonymity must be a difficult one to carry off. 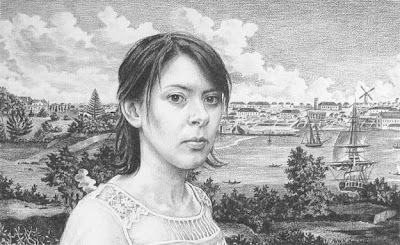 What the Dobell does this year is present a work that shows the restless brilliance of drawing, in overview it isn't exactly revolutionary but that isn't always a bad thing. It's worth time spent there are real challenges and pleasures here. Much of the work is immediate, emotional and immersive. Great drawing can do that.